Roger Miller Museum 101 E Roger Miller Blvd Erick, OK 73645 Phone: 580-526-3889 580-515-1540 Fax: 580-526-3331 E-mailWeb Site View all Photos Description Located in Erick at the corner of Sheb Wooley Ave and Roger Miller Blvd, a renamed section of Route 66, the Roger Miller Museum gives travelers and visitors a one-of-a-kind glimpse into the life and times of Roger Miller, one of Oklahoma’s and Erick’s favorite sons. The newly renovated museum features exhibits, memorabilia and personal effects celebrating the life and accomplishments of this unique songwriter and entertainer. Among the items on display are music, photographs, videos, instruments, clothing, Roger’s high school FFA jacket and essay, handwritten lyrics, Roger’s army shirt from Korea and even the motorcycle he was riding when he met Elvis. In addition, visitors can watch DVD footage on the big screen TV in the audio/video room of past performances by Miller, plus many tributes made by his colleagues. Come and share the wit and wisdom of Roger Miller. He was a true original, whose dreams and talent led him to be considered one of the most influential country artists of the 20th Century. 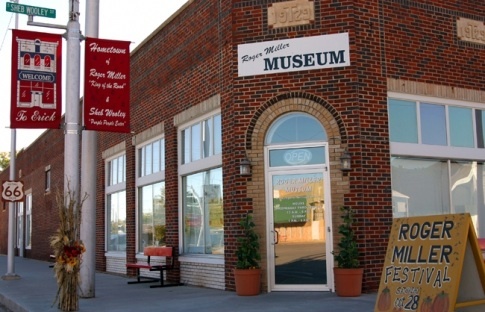 The museum also includes a gift shop with music CDs performed by Miller, King of the Road caps, t-shirts and more, along with other unique items relating to western Oklahoma.